A lot of questions has been rolling in from a lot of JAMB 2019 candidates about the result. When will JAMB 2019 result be released? How will I check JAMB result for 2019? Do I need a scratch card to check my result? Can I check my JAMB result online? These are some of the questions that candidates demand quick answers to. This article will answer the questions above and also guide you on how to check your JAMB 2019 result with ease. Just seat tight and keep reading. JAMB doesn’t release all results at once,it is usually released in batches . Usually, they release it 48—72 hours after the examination , but they might deicide to release everything after the exam is concluded. So, which ever method they adopt, just keep checking this site to be updated. Do I need scratch card to check my result? No, the idea of using scratch cards to check results has been scrapped off. Candidates can now check their results online without it. There are two major ways the result can be accessed. 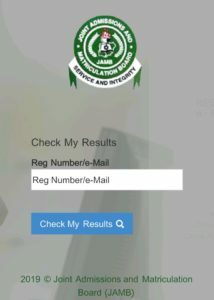 You can either check results directly through the JAMB result checker page or through the official JAMB 2019 website. 2. Input your JAMB registration number in the space provided. 3. Click on the ‘check my result’ button. 4.Your result will be displayed immediately depending on your network connection. 2. Input you Email and password in the provided spaces then login. 3. Immediately, your profile is opened, scroll down 👇and click on check result. 5. Your result will be displayed immediately. Hope this article on how to check JAMB result was useful to you.If this article was useful to you, kindly share with your friends. Thanks for reading.